Go out for pizza on April 26 from 5:30-7:30 p.m. and help decide who makes the best pie in Elmhurst. It’s the annual Top Pizza – Taste of Elmhurst fundraising event that features the best pizza from shops and restaurants throughout the Elmhurst area. For just $10 per person, you can taste and vote on the many traditional and specialty pizzas featured in the Top Pizza competition. At Elmhurst Toyota, we love pizza. To sample so many different pies in one evening sounds like a slice of heaven to us. We hope to see you there! At Top Pizza – Taste of Elmhurst, local pizza makers will deliver traditional favorites such as cheese and sausage as well as some exciting specialty pies. Gluten-free options will be available, and you can even place your order in advance. Drinks and dessert can be purchased at the event. Stop by for dinner or stay for the whole evening and be treated to a musical performance by York Community High School students. Remember, you and the other attendees at Top Pizza – Taste of Elmhurst wield the power to decide who gets bragging rights for Elmhurst’s best pie in 2018. Vote for your favorite pizzas in multiple categories, including best crust, best cheese, best sauce and more. Elmhurst’s 2017 overall pizza winners were Lou Malnati’s Pizzeria, Mama Maria’s Pizza, Roberto’s Ristorante and Di Leos Pizzeria. 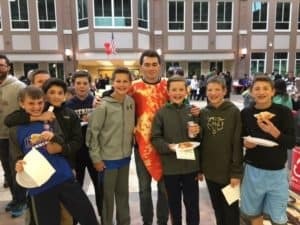 Last year’s Top Pizza – Taste of Elmhurst was attended by nearly 500 people and raised $6,000 for the thirteen public schools in District 205. The District 205 Foundation uses proceeds from this and other fundraising events for programs that enhance the educational experience of all students in the district. April 26, 2018, 5:30-7:30 p.m.
For $10 per person you can enjoy pizza from every vendor and hear a musical performance by York Community High School students. Go to www.elmhurst205.org/foundation or call 630-834-4530.